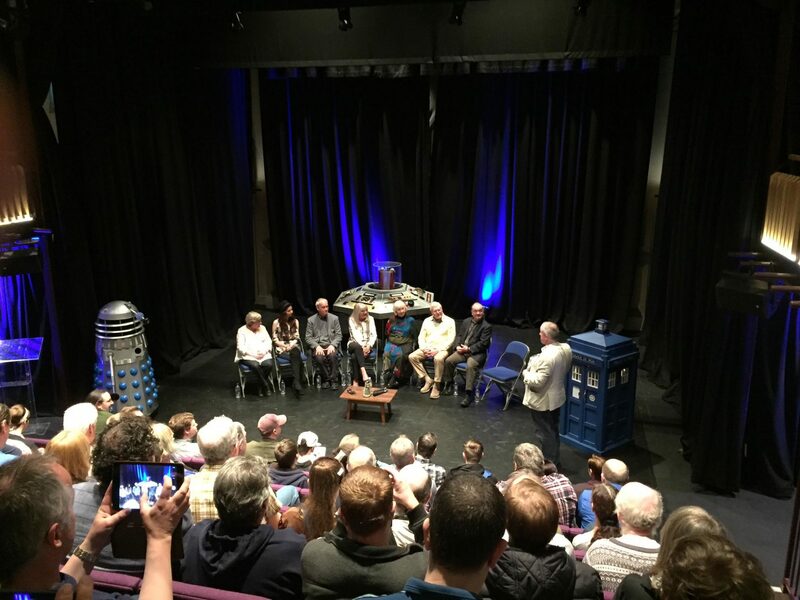 This year’s Bedford Who Charity Con was in a new location – The Quarry Theatre. I think the happy coincidence of being in a quarry in Bedford wasn’t lost on the organisers! (No prizes if you understand the reference.) New venue aside, it was the same informal and easy going event as in previous years, which makes it a winning combination. You just feel more connected with the guests as they mingle and roam around, and this adds to the ambience of the event. The convention is a charity fund-raising event for the Bedford Foodbank. This time, they had their costs covered BEFORE the event, so any monies raised will be pure profit. I did my bit by donating several banknotes of different denominations for a souvenir programme and my photo opp! This is a worthy charity – but one that we wish didn’t need to exist. There’s more than enough money and food in this country to make sure people don’t go hungry… but they do. And this is where the Foodbank comes in, giving out food packages to hungry families who can’t afford to feed themselves. 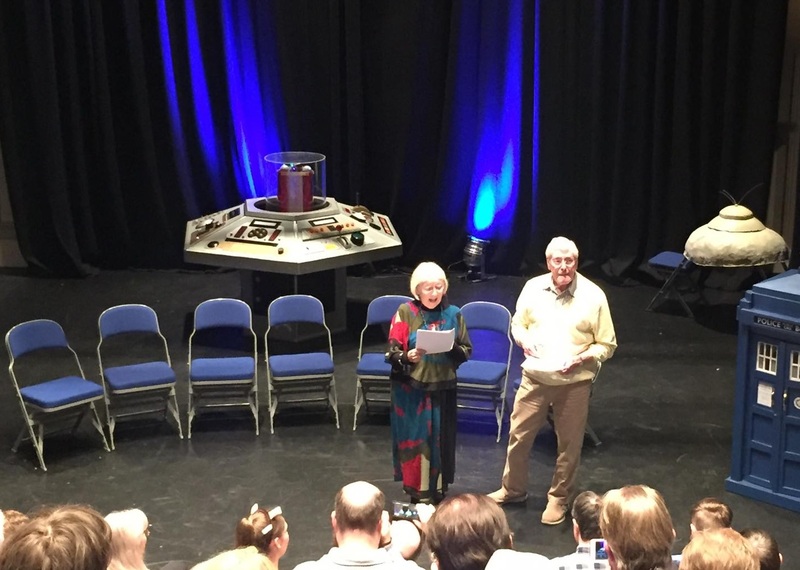 The day kicked off a little behind schedule thanks to the vagaries of our great British rail network, but nevertheless, it all ran fairly smoothly from then on, starting with The Companions interview featuring Peter Purves (Steven Taylor), Anneke Wills (Polly), and Maureen O’Brien (Vicki). Once again it was pointed out that even though William Hartnell created the definitive role of the Doctor, if it hadn’t been for Patrick Troughton’s enormous talent making the concept of regeneration work by making the role his own, then the show would have folded pretty quickly. Thank you, Patrick! After the first break, we had The Villains panel with Geoffrey Beevers (The Master/Melkur in Keeper of Traken and numerous Big Finish audios) and Sarah Louise Madison (Weeping Angel in The Time of Angels/ Flesh and Stone, The Angels Take Manhattan, and Time of the Doctor and the slightly less scary time zombie in Journey to the Centre of the TARDIS). This session turned somewhat philosophical touching on the nature of evil – the Angels aren’t really evil as they are acting on their nature, although they did some nasty stuff with the ripping out of spines in later appearances. Geoffrey took us down that route with the quote that evil always starts with the intention to remove evil in others. The Master is more of a pantomime villain, but true evil in the real world doesn’t see itself as such. 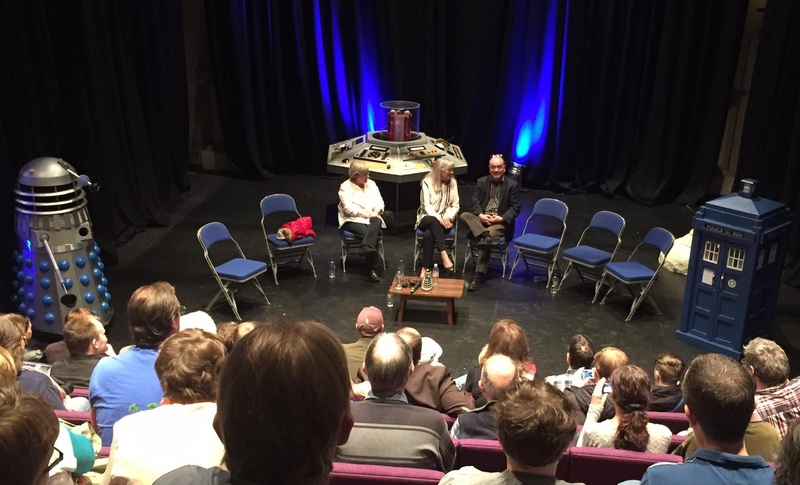 The third panel of the day was concerning Big Finish and BBC Books, with Mike Tucker (BBC visual effects department alumni before starting his own company, The Model Unit) and Una McCormack (novelist and Big Finish writer). After the long lunch break that incorporated a mammoth signing session for all the guests, we had Mike Tucker doing a presentation covering various costume restorations his team has done in recent years for the Doctor Who Experience. This was a fascinating overview of the work that goes into these restorations and the sad state that these precious artefacts were in before he got to them. It is worth remembering that these costumes were originally built with the thought that they would only be needed for a few weeks shooting at most… and yet, some of them survived for 30-40 years in various states of decay (see what I did there?). Some of them would have survived even better if looked after properly! They had been seriously manhandled and neglected over the years. Anyway, it was a fascinating look at the work that went into restoring the Terry Molloy version of Davros, a Mandrell costume from Nightmare of Eden, and the Morbius creature from The Brain of Morbius. There were several performances during the day of sketches written specially for the BWCC – The Master on the psychiatrist’s couch being deliciously evil, and Steven and Vicki at a companions’ reunion. Both of these sketches were very well received by an appreciative audience… and keep an eye out on the DWC to see them, plus an exclusive peek at the scripts! Once again, a thousand thanks go to Simon Danes for organising the event, which is a “must attend” event if you live anywhere near by. Or if you just live anywhere, actually. Just make sure you get there next year for a traditional style convention on a small and intimate scale that allows you the feeling of being up close and personal with the guests. In a good way. All images © Simon Mills. 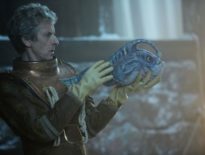 ← What Did You Think of Doctor Who: Thin Ice?